I’ve been volunteering for 5 plus years. I chose Pritchard Beach because it’s a beautiful setting; it has a pond which adds complexity, and interest. It had been restored earlier and had foundation to build on, and my friend Catherine wanted to get involved and co-steward with me. I love getting immersed in planting and digging. When this happens, the everyday life stuff melts away and I can hyper focus on the natural environment. I have many funny and favorite moments. A highlight was at the beginning of a work party at Pritchard Beach, we spotted an owl on a low branch near the path. The kids and parents were transfixed, and sparked some great conversations during the work party and afterwards. On an especially drizzly day, my co-steward, Catherine showed up in a wet suit. I missed the event, so hearing about it second hand in an email was hilarious. Grateful neighbors showing interest in the restoration work, interacting about the wildlife and plants. When we managed to clear most of the blackberries from the meadow and began to see the native wildflowers and conifers springing back to life. Non-native plants would be blackberry, and bindweed. My favorite work horse plant is the slough sedge. I’ve just gotten to know it since I started working in this wet environment, and I order it every year to expand its range. It fills in beautifully under Oregon ash and Western redcedar in the wet areas. I would be working in my garden, walking in the parks, kayaking, hiking in the mountains. I like to spend part of everyday outside. I feel very grateful to have this opportunity to volunteer as a forest steward. It’s like a new career. One I dreamed of pursuing but didn’t have the opportunity when I was younger. As a retired person it is such a joy to work at something that feels like a vacation. 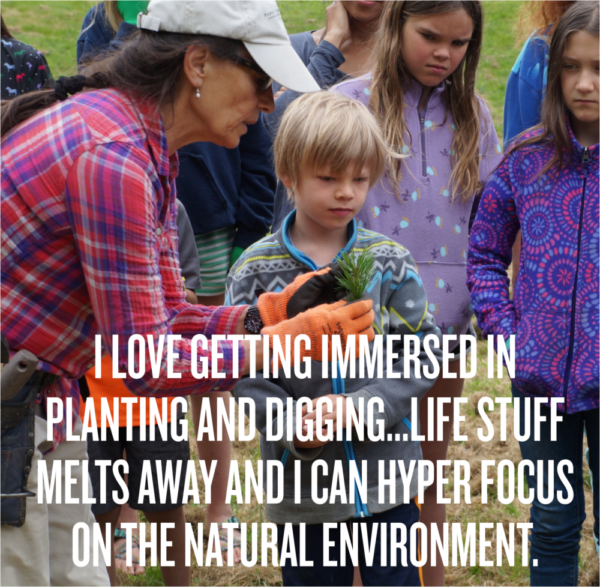 Want to have your own chance to meet Kathy and to hear more about her time as a Forest Steward with Green Seattle? Then you should attend one of the upcoming volunteer work parties at Pritchard Island Beach and help Kathy to continue her Forest Steward legacy!